CIRCOR Pumping Technologies will unveil its HouttuinTM TT two-screw pump series at StocExpo in March. The lighter, smaller pump is designed to help both refinery and tank terminal operators optimise their unloading and transfer applications. 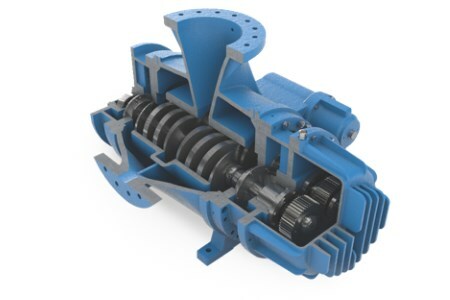 Houttuin positive displacement pumps offer reliable delivery of a variety of fluids at a desired rate, even under changing or unpredictable process conditions. With the new series, pumps can load or unload cargo in the same amount of time, regardless of the liquid involved or the discharge head required. This series offers higher flow capability and lower net positive suction head (NPSH) than similarly-sized pumps for these applications. With discharge pressure limited to 20 barg, this pump’s narrower root diameter increases the displacement, resulting in greater flow at the same pressure. The TT series has an NPSH of as low as 1.5 mwc at full speed, depending on process conditions. This makes well-suited for operation in difficult low NPSH/high vapour pressure fluid applications compared to alternatives. With it comes the peace of mind that variable storage fluid levels or inlet pressures won’t compromise operation, while operators can safeguard the pump against cavitation. Compliant with API 676-3rd, the Houttuin TT series is ideal for oil and gas applications.